I thoroughly enjoyed this book. So much more than I thought I would...and so much that I could probably start from the beginning right now and read the whole thing through again. There was so much to learn and imagine and I know I missed a lot being distracted by surgery and a move. I will definitely be keeping it in my collection to go back to from time to time. From Amazon: "The late nineteenth century was a period of explosive technological creativity, but more than any other invention, Thomas Edison’s incandescent light bulb marked the arrival of modernity, transforming its inventor into a mythic figure and avatar of an era. 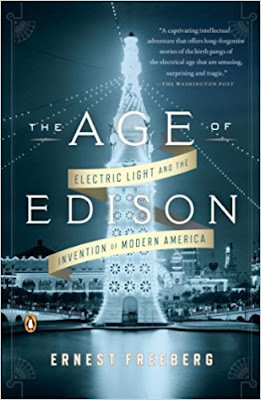 In The Age of Edison, award-winning author and historian Ernest Freeberg weaves a narrative that reaches from Coney Island and Broadway to the tiniest towns of rural America, tracing the progress of electric light through the reactions of everyone who saw it and capturing the wonder Edison’s invention inspired. It is a quintessentially American story of ingenuity, ambition, and possibility in which the greater forces of progress and change are made by one of our most humble and ubiquitous objects." The advent of electric lights had such an amazing effect on society. It changed people's sleep patterns, thus changing their entire routines, traditions, and family and social lives. It served to further differentiate between social statuses. It made an impact in so many way that I never could have imagined. I thought it was interesting that so many species of birds and bugs were discovered as they were found dead at the base of street lights in the mornings. The idea of "electro"hunting and fishing was also interesting. I was also surprised by how late into the 20th century electricity became common in middle-class homes. Less than 15% of homes were wired for electricity in 1910---and only 70% by 1930. Pg. 267: "Self-evident today, the proper use of an incandescent lamp is a social practice that, according to one electrician, was misunderstood by 99 percent of Americans in the early twentieth century. Why pay so much for electric light, these customers surely wondered, only to hide it behind a shade or to place it out of the line of sight... Such an idea must have seemed like the scheme of unscrupulous electric-current salesmen eager to sell customers more light than they needed." Pg. 283: "These changes in technology produced a corresponding change in the way middle-class American families interacted once the sun went down. Some complained that since family members felt less compelled to draw together each night around a common lamp, their bonds had weakened and the art of conversation had suffered. People talked less and read more, as cheaper books and more evening light encouraged the explosive growth of what people at the time called a new 'reading habit.'" Lastly, I was compelled to ponder the last line of the book and wonder about the actual validity of this quote from Franklin Roosevelt: "Electricity is no longer a luxury, it is a definite necessity." I wonder---how would our society get by if we no longer had access to electricity? This sounds very interesting! I am thankful for electricity. That does sound interesting. We take so much for granted. I do remember hearing "old-timers" talk of not having electricity in rural areas much later than city folk had it. The Tennessee Valley Authority in north Alabama was a big part of Rural Electrification Administration. Here's an article that's interesting, and also the linked testimonial by Rose Scearse.